Below are a few ideas to help with your stone budget. 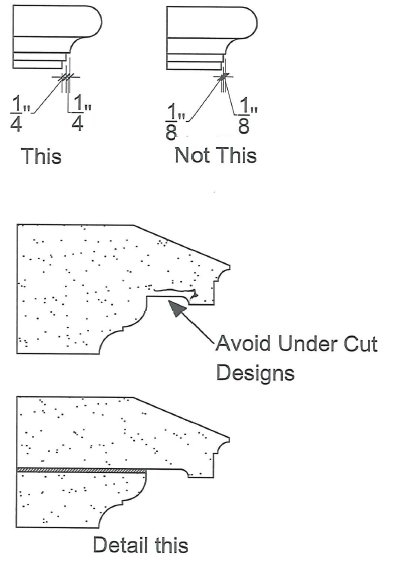 Deep cut moldings and moldings that are undercut take longer to produce and increase the time and cost of production. 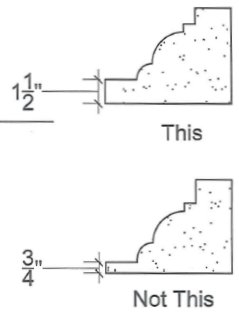 Molded pieces should be no less than 1-1/2″ thick at the thinnest point. Steps should be no less than ¼” to assure a sharp edge. This design can break. If not in production, in handling. To serve with confidence, skill and craftsmanship and to empower our employees and our customers with the opportunity to grow and prosper. To deliver excellence in service and in product. We are driven to perform with integrity, to be respectful and to be a team player.